Sign Up to access LIVE Call and receive email reminders. We are working on getting video clips posted to the Pillai Center Practice YouTube Channel in the Powertime Practice Playlist. Thank you to the volunteers who have stepped forward! We need volunteers to do service on Facebook, edit videos, and write. If you would like to experience the blessings of doing selfless service, please email us at powertimepractice@pillaicenter.com. Good morning fellow spiritual travelers! Sucharita welcomed us on the Powertime Practice call on April 13, 2019. Remember to join the Free Vedic New Year Webcast with Dr. Pillai today, April 14, at 8:00 am PDT (3:00 pm UTC). Join Here. Saturdays are ruled by Saturn, and Saturn is a god who wants us to get going and do what we are supposed to be doing. We should be doing something, even before we get out of bed in the morning, that gets us started on our spiritual day. Saturn will remove the depression or the stuck energy that is congesting our consciousness. He will help us to recognize the higher self that lives in each of us so we can honor that self. Rama‘s birthday was yesterday. Dr. Pillai says, “The story of Rama cannot be fathomed by human intelligence. Rama’s story is happening all the time in one galaxy or another. Rama sacrificed more than any Avatar, absorbing human suffering in totality. The 9th Waxing Moon (Rama Navami) is his birthday. Birthdays of Gods provide a link to them. Therefore, it is very important to meditate, worship or visit their temples on this day. Spend the 9th day thinking of Rama and praying to him.” Rama will help us to kill off our negative karma. Sucharita showed us a picture of Rama’s coronation, with all the gods and his wife Sita. Hanuman is among the audience. Hanuman is the monkey faced god who adored Rama. The sounds Ra and Ma preceded Rama. The sound Ra means the Sun, and the sun represents our soul. Sucharita recommends that everyone get an astrological reading. It’s like having a map of your life so you can know where you are headed in your lives. You can avoid the pitfalls and take the detours around the difficult karma that may be happening in your lives. AstroVed has some great astrologers that are available for readings. This is the final night of the Nine Nights of the Goddess and we are honoring Saraswati, the goddess of education, art and intelligence. Her energy will help us to use our time wisely, in a divine and enlightened way. “Each day comes with a certain energy, and that energy is decided by the Moon conjoining with a certain star. The day is known by the star and Moon phase. You will then know what the energy of the day will be, and what is best to do during that time.” ~ Dr. Pillai . We are learning to honor the nine planets and their position in the heavens. Sucharita showed us a yantra with all the symbols of the planets. She showed us a statue of the Sun Goddess, Gayatri, who will show us how to use our senses sensibly! We can get deluded by the influence of the environment around us. Money cannot buy us happiness, so we must concentrate on our spiritual progress. We honored Lord Rama for his birthday, and also Brahma (the creator), Vishnu (the sustainer) and Siva (the destroyer). In our puja we offer them food for the earth element, incense for the air element, water for the water element, light in the form of a ghee lamp for the fire element, and flowers for the space element. To make our supplications fly fast to the Divine, we use flowers! We called on Ganesha, the remover of obstacles, honoring him first. We called on a satguru, Dr. Pillai, our enlightened guru. Sucharita showed us a black rock in the shape of a nautilus shell, with a spiral that represents our spiritual journey. It goes on and on endlessly. This is a representation of Rama. She showed us how to honor the sun, Rama and Ganesha in a quick ceremony that we can do every morning. Lord Rama was born as a prince. He was a virtuous son who believed in dharma (righteousness) and an ideal king who devoutly cared for his family and kingdom. He was the guardian of humanity and was committed to evolving humans to a higher state in life, both spiritually and materially. 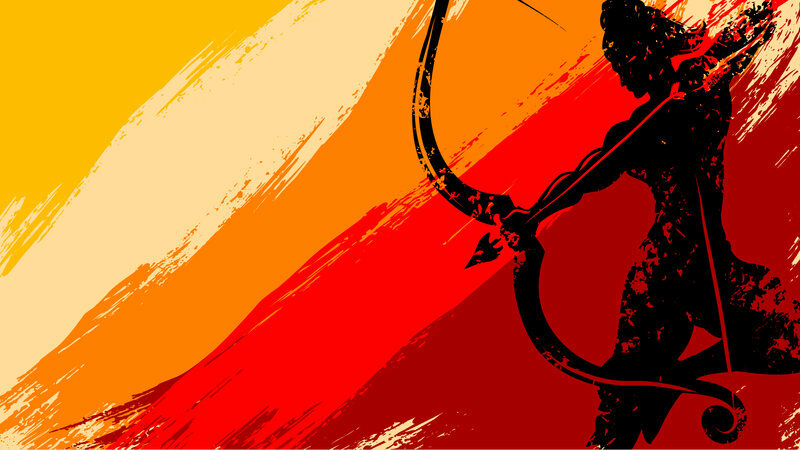 Rama was a warrior who embodied all virtues and fought for truth all his life. It is very important to honor the birth of avatars, as they represent true hope for the world and their birthday is a reminder that you can awaken their divine energy within you. Sun moves into Aries, a symbol of the renewal of the world. This celestial alignment favors new beginnings and helps harness the Sun’s energies to fill your entire year with wealth, health and prosperity blessings. In Vedic astrology, Sun is the most powerful when in Aries, the sign of exaltation. On this auspicious day, which marks the beginning of the Vedic New Year, AstroVed’s powerful suite of services can help to remove obstacles and gain good health, success, fame, and prosperity. Learn more. Ekadasi is the day when Vishnu’s blessings for wealth and health are abundant. Chant Om Namo Narayanaya for Vishnu or Shreem Brzee for his consort, Lakshmi. To help you invite money blessings in 2019, Dr. Pillai is recommending an exclusive Fire Lab to invoke Kubera, the banker of Heaven on the most auspicious time- the Ekadasi (11th Waxing Moon), the powerful day filled with the energy to create material and spiritual gains. Learn about the Banker in Heaven’s Kubera Wealth Homa. The 13th Moon phase is called Pradosham, a karma-removing time. 1 1/2 hours before sunset through sunset is the most powerful time to pray to Siva to dissolve your bad karma. Hydrate a sivalinga by pouring water/milk/juice over it as you chant the karma busting mantra, Thiru Neela Kantam Makaral Shivayanama. Visualize blue light in your throat. Roll and break a coconut or lime(s) to remove karma. Ganesha is especially very powerful and present on the 4th and 14th moon phases. Call on him to remove your obstacles by chanting his mantra, Om Gum Ganapataye Namaha. Roll and break a coconut or lime(s) to remove obstacles and karma. Every Full Moon is time of incredible energy for both prosperity and enlightenment. Your spiritual practices and meditations on this day/night will be very powerful. Chant Shreem Brzee for wealth. Chitra Purnima is a day of Divine Grace to receive blessings to erase your karmic records. Learn more.